In 2011, as a part of the second phase of the Integrated Land Use Assessment of Zambia (ILUA), satellite image samples were processed by the European Commission Joint Research Centre (JRC) and FAO at a more intensive half-degree grid spacing to match the ILUA field plots on the ground. The aim is to produce the first ever national level historical rates of forest area change for 1990 - 2000 - 2005. Results are in the process of being analyzed. A poster highlights key steps in the coordinated approach in Zambia. To view the poster, kindly click on the image. A website has been set up by South Dakota State University (FRA partners in RSS) to show the locations of all the FRA RSS sample sites and show some examples of the Landsat and MODIS imagery. You can download the locations in shapefile format for use in GIS systems or Google Earth KMZ format. In 2008 a subset of around Landsat 400 images were available as examples that are used in the Pilot Study to test the methods during 2009. Other images will be added as they are made available from: http://globalmonitoring.sdstate.edu/projects/fao/gridindex.html. The FRA Remote Sensing Survey (RSS) is mainly based on optical remote sensing data from Landsat imagery which can sometimes be obscured by clouds – particularly in tropical areas. One advantage of radar is that it is an active remote sensing method that has the ability to penetrate and “see” through clouds. 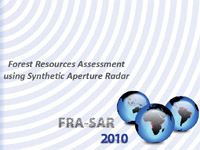 The FRA-SAR 2010 component will use analysis of state of the art Synthetic Aperture Radar (SAR) satellite data to help overcome the data gaps and FRA partners at Jena University in Germany will undertake research on application of these techniques with support from the German Government (GTZ). A short 6 page summary of the project is available. For more information on the FRA-SAR work and the location of the study areas please go to the website: http://www.frasar2010.uni-jena.de/. The Global Forest Resources Assessment Remote Sensing Survey project is supported with the financial assistance of the European Union.